Do you ever get, while giving a presentation, that uncanny feeling that something’s missing? Well, of course, you just need my color-powered slide changer! Thanks to this gimmick you can change slide just by showing a green object to your computer’s webcam. My program will detect the specified kind of green and it will simulate the SPACE key pressure, used by any serious presentation tool to advance to the next slide. raise the other two sliders in order to remove the environmental noise (e.g. green detected outside your object); this might lower the quantity of green detected on your object to a bare minimum, but as far as there is any the program will work as expected. Caveat: in order to avoid uncontrolled slide advancing the program will wait 2 seconds after detecting the green object before restarting the detection again; you can use these two seconds to remove your green object from the webcam sight, after changing slide. This toy works surely on Linux, I didn’t bother trying it on other platforms; anyway it should work anywhere there is OpenCV and Xorg. 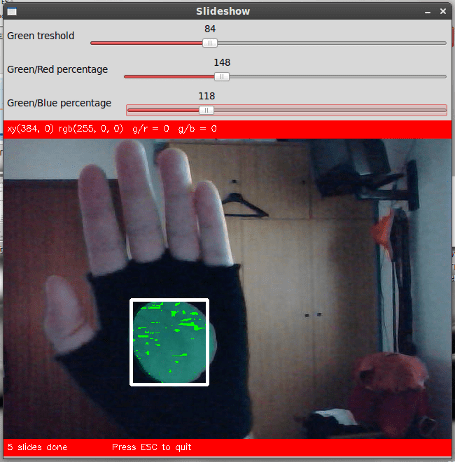 I used this program to do my master degree dissertation and it worked quite well; in that occasion the green object was a green dot in the middle of a black glove. Hahaha erano mesi che volevo mettere su Internet ‘sta roba, finalmente l’ho fatto. 😀 Tra l’altro, ricordi la storia delle libc6 & co. come dipendenze? Sul progetto in Mono nada, ma su questo che ha un’eseguibile normale “debuild” guarda quali librerie usa (con ldd credo) e ce le mette in automatico (al posto della variabile shlibs o qualcosa del genere)!